The Black Type Library allows users to look at a prescribed period of Black Type races–from one day to any time in the past 20 years. The default setting is the past 7 days, listed in order by Grade, from Grade 1 to 2, 3, Listed and Black Type. 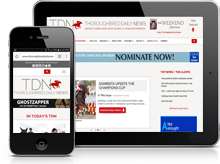 You may re-order this in any way, for any time period, choosing to view by sire, dam, damsire, date, race name, etc., by using the dropdown menus at the top of the page, or by clicking on the column headers. Clicking on a race brings up the race detail; clicking on a horse or sire brings up all of that horse’s Black Type wins with the time period you have chosen. Links are also available for Equibase race charts, sales information, catalogue pages, and pedigrees for winners of Grade or Group 1/2/3 races. Click for a quick review of Black Type-placed progeny alphabetically listed by Sire. Use the following criteria to refine your information search. Leaving a field blank will declude it from the criteria. When selecting longer timeframes you must narrow your search as large amounts of data may be returned.